When the time comes to update your kitchen, you want to find your unique style and make sure you will be happy with the design for years to come. After all a kitchen remodel is a big project that requires time and money, so you want to ensure you get it right. Not only do you want style, but you also need the style to fit the function and flow of your family. Even if you aren’t opting for the full-blown renovation, you can still update your kitchen to complement your personal style by painting your cabinets, adding a backsplash or new countertops, or changing your flooring. The dilemma is, you have to know what style you like before you begin, so let’s explore some of today’s popular kitchen styles and help you find the one that is perfect for you and your kitchen. Contemporary kitchens are minimalist sleek and feature neutral color palettes, metallic accents including stainless steel, and bold décor. Black, white, gray, and metallic are the colors of choice for the contemporary kitchen which may feature bright and colorful accents with deep, dark wood or polished concrete flooring. Countertop favorites in the contemporary kitchen include glass, granite, quartz, and marble. The goal in the contemporary style is streamlined functionality providing a clean, simple livable vibe. Appliances of choice in the contemporary look are stainless steel and white. The contemporary kitchen has no room for clutter, relegating kitchen tools and gadgets to the cabinets and cooking ingredients to the pantry. Think this is your kitchen style? Upgrade your look with a unique backspace created from distinctive tiles and a gleaming new glass countertop or upgrade to modern lighting or paint your walls or cabinets a contemporary color – deep gray, bold red, or stark white or add new flooring like bold polished concrete. Traditional Kitchen Style covers a lot of ground – country, vintage, Victorian – and couples convenience with elegance. Traditional style features elaborate details like cabinets with intricate inserts, chandeliers, patterned tiled floors, farmhouse sinks, and pastel colors. A traditional kitchen is truly timeless, never going out of style. Traditional style often feature glass front painted cabinets with classic granite or laminate countertops, and hardwood or tile floors. Traditional kitchens also allow for tremendous flexibility, allowing you to use classic white mixed with black countertops while adding a bold centerpiece, like industrial bar stools, a bright and colorful island or distinctive pendant lighting. Cottage Kitchen Style lends itself to vintage but with more whimsy like painted or wood cabinets, open shelving, patterned tiles and distinctive fabrics, salvaged flooring and more. Family friendly and understated, beadboard accents, timeless shabby chic elements, and farmhouse sinks promise charm in cottage style. Timeworn counter stools meld with subway tiles and marble countertops, with white upper cabinets and pastel colored base cabinets are the hallmarks of comfortable cottage style. If you think the cottage is ideal for your home, you can begin the transformation slowly by adding decorative molding, an apron-front sink, and crystal pendant lights to add timeless style. Shiplap and schoolhouse lighting blends with travertine flooring and a soothing color palette (blue is the classic for cottage chic) to create pleasing calm cottage kitchen style. An antique patina table, with wicker chairs and a banquette, atop a vintage rug are cottage touches which will welcome family and friends to your new kitchen. 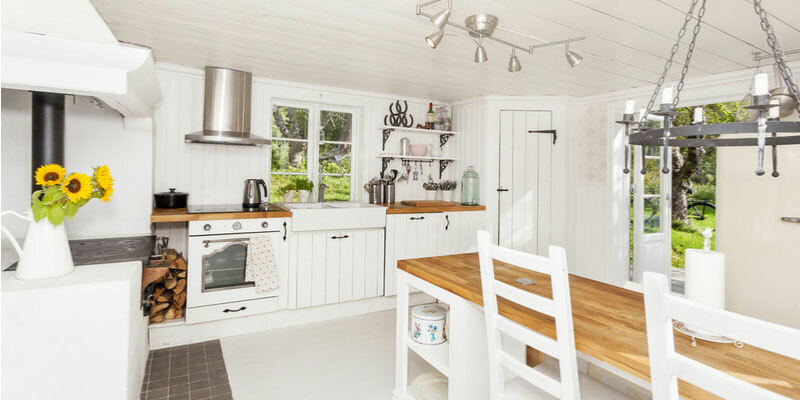 Cottage Kitchen Style is ever evolving and is often dependent on your region of the country, making it one of today’s most popular kitchen styles.